Bad credit makes many things difficult, impossible, or more expensive. For example, did you know insurance companies often charge a higher interest rate for drivers that have bad credit scores? If you're getting new utilities turned on in your name, the company will check your credit to decide whether you should pay a security deposit. We all know that banks check credit scores before they give you a credit card or a loan. As years go by, the list of companies who check your credit will probably grow instead of shrink. Why Repair your Credit? Credit repair is critical to saving money on insurance, loans, and credit cards, but that's not the only reason to repair your credit. A better credit score opens up new employment opportunities, even promotions and raises with your current employer. If you dream of starting your own business or just want the security of knowing you can borrow money when you want to, you should repair your credit sooner rather than later. Do It Yourself Credit Repair You've probably seen advertisements for credit repair on television or heard them on the radio. Maybe even seen credit repair signs on the side of the road. You don't have to hire a professional to fix your credit. The truth is, there is nothing a credit repair company can do to improve your credit that you can’t do for yourself. Save some money and the hassle of finding a reputable company and repair your credit yourself. The next steps will show you how. Before you can start repairing your credit, you have to know what you need to repair. Your credit report contains all the mistakes you've made that have led to bad credit. Read through your credit report to see what are the negative items affecting your credit score. By law, you’re entitled to free credit reports from each of the three credit bureaus each year. This yearly free credit report is available only through AnnualCreditReport.com. Other Ways to Get a Free Credit Report You're also entitled to a free credit report if you've been turned down for credit because of something on your credit report, if you're currently receiving government assistance, if you're unemployed and planning to look for a job soon, or if you think you've been a victim of credit card fraud or identity theft. Some states even have laws that let you get an additional free credit report each year. All these free credit reports should be ordered directly through the credit bureaus. Paying for Your Credit Report If you've already used up your free credit reports for this year, you can order your credit reports directly from the credit bureaus for a fee. The bureaus all offer a three-in-one credit report that lists all three of your credit reports side-by-side. The three-in-one credit report costs more than a single credit report, but less than the combined price of purchasing your individual credit reports. Why it is Important Order All Three Credit Reports? Some of your creditors and lenders might report only to one of the credit bureaus. And, since credit bureaus don’t typically share information, it’s possible to have different information on each of your reports. Ordering all three reports will give you a complete view of your credit history and let you repair your credit at all three bureaus instead of just one. It's a good idea to make an extra copy of each report in case you need to dispute information. You can send the copy of your report to the credit bureau and keep a copy for yourself. Always Review Your Credit Report for Errors Once you have your credit reports, read through them completely. If you have a long credit history, your credit reports might be several pages long. Try not to get overwhelmed by all the information you're reading. It's a lot to digest, especially if you're checking your credit report for the first time. Take your time and review your credit report over several days if you need to. How to Read Your Credit Report Become familiar with the information contained in each of your credit reports. They'll all look very similar, even if you've ordered them from different bureaus. Each credit report contains: your personal identifying information, detailed history for each of your accounts, any items that have been listed in public record like a bankruptcy, and the inquiries that have been made to your credit report. How to Decide What Needs Repairing Incorrect information, including accounts that aren’t yours, payments that have been incorrectly reported late, etc. Past due accounts that are late, charged off, or have been sent to collections. Maxed out accounts that are over the credit limit. Use different color highlighters for each type of information to help you easily make a credit repair plan. You'll take a different approach for incorrect information than you would for a past due account so using different colors save time re-reading your credit report each time you're ready to payment a payment, call a creditor, or send a letter. Dispute Credit Report Errors You have the right to dispute any information in your credit report that's inaccurate, incomplete, or you believe can't be verified. When you order your credit report, you'll receive instructions on how to dispute credit report information. Credit reports ordered online typically come with instructions for making disputes online, but you can also make disputes over the phone and through the mail. The best way to Dispute your Credit Report is online. Its faster and easier! You can also send disputes through regular mail which has several advantages. First, you can also send proof that supports your dispute, for example a cancelled check showing you make your payment on time. You can also keep a copy of the dispute letter for your records. Finally, if you send your dispute via certified mail with return receipt requested - which you should - you have proof of the time you mailed. This is important because credit bureaus have 30-45 days to investigate and respond to your dispute. What Happens After your Dispute If the dispute is successful and your credit report is updated, the bureau will make the change, alert the other credit bureaus, and send you an updated copy of your credit report. On the other hand, if the item isn't removed from your credit report, your report will be updated to show that you've disputed the information and you'll be given the opportunity to add a personal statement to your credit report. Personal statements don't affect your credit score, but give additional insight into your dispute when a business manually review your credit report. Your payment history impacts your credit score Since payment history is such a large part of your credit score, having several past due accounts on your credit report will significantly hurt your score. Taking care of these is crucial to credit repair. Your goal is to have all your past due accounts reported as “current” or at least “paid.” Get current on accounts that are past due, but not yet charged-off. A charge-off is one of the worst account statuses and happens once your payment is 180 days past due. Accounts that are delinquent but less than 180 days past due can be saved from charged-off if you pay the total amount that's past due. Beware, the further behind you are, the higher your catch up payment will be. Contact your creditor soon to figure out what you can do to get back current. They may be willing to waive some of the late penalties or spread the past due balance over few payments. Let them know you're anxious to avoid charge-off, but need some help. Your creditor may even be willing to re- age your account to show your payments as current rather than delinquent, but you'll have to actually talk to your creditors to negotiate. Pay accounts that are already charged-off. You're still responsible for a charged-off balance. As they get older, charge-offs hurt your credit score less, however, the outstanding balance will make it hard - and sometimes impossible - to get approved for new credit and loans. Part of your credit repair must include paying charge-offs. If you pay a charge-off in full, your credit report will be updated to show the account balance is $0 and the account is paid. The charge-off status will continue to be reported for seven years from the date of charge off. Another option is to settle charge-offs for less than the original balance, if the creditor agrees to accept a settlement and cancel the rest of the debt. The settlement status will go on your credit report and stay for seven years. You may be able to convince the creditor to delete charge-off status from your credit report in exchange for payment, but this isn't easily done. The most important thing is to pay your charge-off and if you can get a favorable account status, it's an added bonus. Take care of collection accounts. Accounts get sent to a collection agency after they've been charged-off or fallen behind several months. Even accounts that aren't normally listed on your credit report can be sent to a collection agency and added to your credit. Your approach to paying collections is much like that for charge-offs, you can pay in full and even try to get a pay for delete in the process or you can settle the account for less than the balance due. The collection will stay on your credit report for seven years based on the original delinquency. Ways to Deal With Past Due Accounts Bring High Account Balances Below Your Limit Your credit utilization – a ratio that compares your total debt to total credit – is the second biggest factor that affects your credit score. It's 30% of your score. The higher your balances are, the more it hurts your credit score. Having maxed out credit cards costs precious credit score points (not to mention costly over-the-limit fees). Bring maxed out credit cards below the credit limit, then continue working to pay the balances off completely. Your credit score responds better to credit card balances that are less than 30% of the credit limit, below 10% is ideal. Loan Balances and Your Credit Score Your loan balances also affect your credit score in a similar way. The credit score calculation compares your loan current loan balance to the original loan amount. The closer your loan balances are to the original amount you borrowed, the more it hurts your credit score. Focus first on paying down credit card balances because they have more impact on your credit score. Past Due Accounts vs. High Balances You'll probably have a limited amount of money to put toward credit repair each month. So, you'll have to prioritize where you spend your money. Focus first on accounts that are in danger of becoming past due. Get as many of these accounts current as possible, preferably all of them. Then, work on bringing down your credit card balances. Third are those accounts that have already been charged-off or sent to a collection agency. After you’ve resolved the negative items on your credit report, work on getting positive information added. Just like late payments severely hurt your credit score, timely payments help your score. If you have some credit cards and loans being reported on time, good. Continue to keep those balances at a reasonable level and make your payments on time. Get New Credit • You might have to reestablish your credit by opening up a new account. Past delinquencies can keep you from getting approved for a major credit card so limit your credit card applications to one, at the most two, until your credit score improves. This will keep your credit inquiries low. 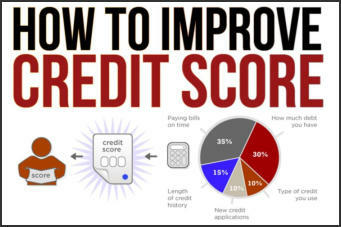 Credit inquiries are added to your credit report each time you make a new application for credit and too many of them hurts your credit score and your ability to get approved. • If you get denied for a major credit card, try applying for a retail store credit card. They have a reputation for approving applicants with bad or limited credit history. Still no luck? Consider getting a secured credit card which requires you to make a security deposit to get a credit limit. In some ways, a secured credit card is more useful than a retail credit card because it can be used in more places. • Salvage what you can. Don’t sacrifice accounts that are in good standing for accounts that are not. Continue making timely payments on all your current accounts.​ • Spread your disputes over a period of time. If you're disputing several items on your credit report, only put one dispute in each letter and space out your disputes. The credit could become suspicious of too many disputes and consider them frivolous.​ • Be careful closing credit cards. Rarely does closing a credit card help your credit score. In fact, closing a credit card is more likely to hurt your credit score, especially when the account has a balance.​ • Learn what things hurt your credit score. Learn what things have a negative effect on your credit score so you can avoid making these mistakes.​ • Don't be discouraged by setbacks. Your credit score may drop unexpectedly as you go through credit repair. This doesn't necessarily mean you've done something wrong. Continue adding positive information to your credit report and your credit score will improve over time.​ If your debts are overwhelming, creditors aren’t willing to work with you, and you can’t seem to come up with a payment plan on your own, consumer credit counseling is an option for getting back on track.​ However, if bankruptcy is inevitable, file sooner rather than later. If filing bankruptcy is the only way you can get back on track, don't waste time on strategies that won't work. Evaluate whether you should file bankruptcy early so you can start the process and begin to rebuild your life.